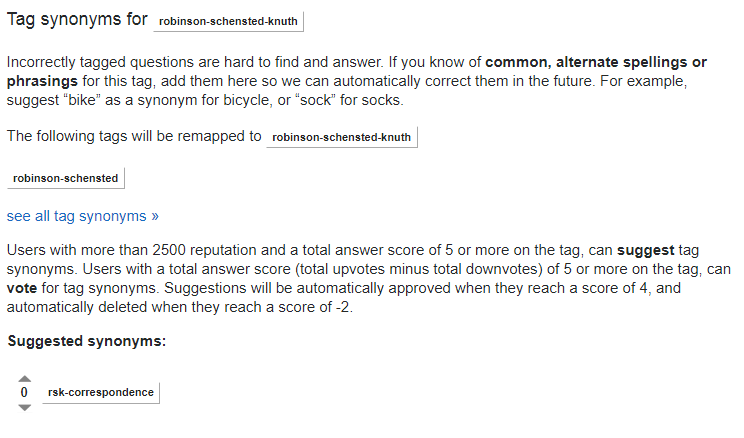 When I look at list of tag synonyms I see there a pending synonym rsk-correspondence $\to$ robinson-schensted-knuth and François G. Dorais♦ is listed as the creator. You can also see that this synonym is still waiting for votes on the corresponding page. I know that regular users can suggest synonyms and in such case they need votes from other users. But AFAIK synonyms suggested by mods do not have to go through this procedure. Is this unusual exception a bug? In case the situation changes, I have added screenshots below. 1It seems that there is an exception to this, depending on how the moderator created the synonym. At least according to this post: Allow diamond moderators to create tag synonyms on their meta sites from the synonyms page? (I only found the linked post after posting this question.) I should say that even after finding out about this possibility, it seems to me a bit unusual - since you can see that two synonyms were created nearly at the same time, so it does not seem very likely that for creating one of them the moderator in question would use a different way than for the other one. Browse other questions tagged support tag-synonyms moderators .